To all breastfeeding mommas out there – way to go! Seriously, breastfeeding is hard work – and so is pumping. I was lucky enough to get to spend the first 5 months of O’s life at home with him. By the end of that time I finally felt like I had really started to get the hang of things – and then it was back to work and a life of pumping 3-4 times a day. Prior to O, I had heard that some women produce so much milk that they end up full to their armpits, while others aren’t quite able to make enough for their little one. I ended up falling somewhere in the middle, especially in regards to pumping. I know that I am so lucky to be able to feed my little one this way, but man, I work hard for my pumped milk! 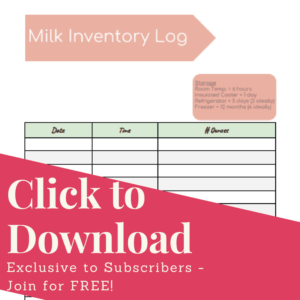 Be sure to get your free milk inventory log at the bottom of this post or click here. I wish I had this for myself when I started pumping! I would have saved SO many visits out to my freezer to recount my freezer stash. For any and all of your pumping questions, be sure to check out my new eBook – Pumping 101 and my breastfeeding/pumping posts! When I felt like I was having a dip in my supply – I panicked! I felt like I needed to try something immediately. I ran to my local Target and tried these cookies. These Milkmakers cookies are packed with oats, brewer’s yeast, and flax seed – the ultimate combination of ingredients to give you the milk boost you need. I won’t lie, I was hesitant to try these due to the price and not knowing if they’d work for me. 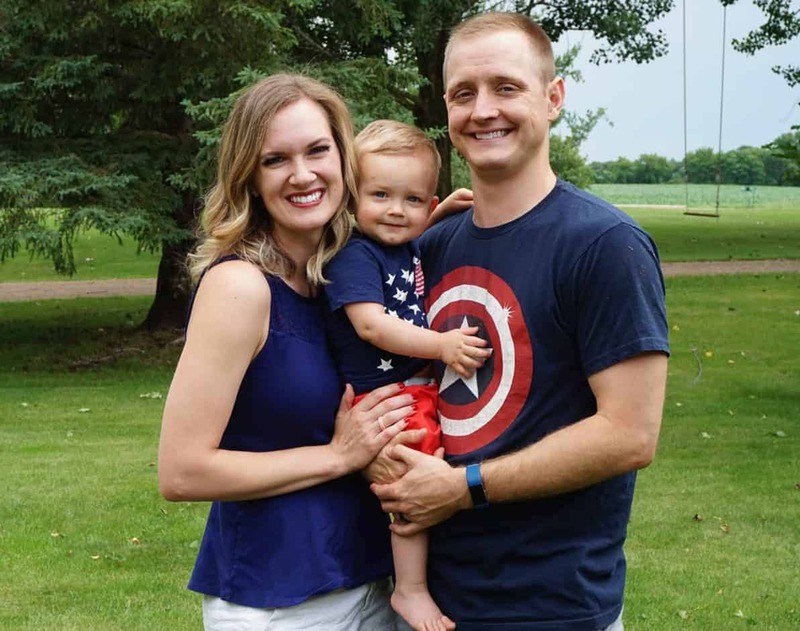 I have good news for moms everywhere – these really did the trick for me! I’ll be honest, at first I wasn’t sold on the taste, but after a couple of days I found myself actually craving them. The cookies are hearty and big, plenty for a snack. They recommend 1-2 cookies per day to see an increase in your supply. I feel they’re a little expensive, but were so easy and really did work wonders for me. Frugal tip: Try making your own! There are lots of recipes that can be found on Pinterest – most contain key ingredients like oats, flax seed, and brewer’s yeast. There’s also an awesome list of 15+ Milk Boosting Recipes that you can find here. I can’t tell you why, but a Gatorade each day really did seem to up my supply! Many people say it’s because of the electrolytes, while others claim against it. For me, it worked, and for the price it’s totally worth a try. Staying hydrated can have a big impact on your milk supply and the bonus electrolytes will certainly help. instead and have also reported good results! 3. Make sure your pump fits YOU and that you know how to properly work it. Women come in all shapes and sizes and no pump magically fits everyone. Your pump is designed to come with the pump parts that fit most women, but might not be right for you. Figuring this out made a huge difference in my amount of pumped milk. I was suddenly able to more completely empty my breasts with each pumping session. By having a breast shield that’s too small, you’re closing off ducts that should be giving you milk. This can also lead to clogged ducts, which can be very painful. By having breast shields that are too large, you’re pulling too much breast tissue in and not creating breast compression in the right places. This can cause discomfort and a decrease in milk output. Who knew a simple change in your pump parts could result in a big change in your milk supply! Check out my post here for more on making sure your pump fits you right! This little gadget is amazing! If you haven’t heard about the silicone manual breast pump yet, you need to check it out. This pump requires such little work from you – and yields some pretty amazing results. I’m starting to feel like all new moms should be sent home from the hospital with this pump, it’s that good. I was skeptical – and to be honest, it was a little hard to keep the pump suctioned at first for me. BUT. The very first time I tried it, I got 3 ounces while my little one ate from the other side! All I did was suction the pump to the other breast, and nurse my baby as usual. No actual pumping or hooking up to a pump required. How easy is that?! For more details on the silicone manual breast pump read my full post here! Please don’t forget about this one, especially if you’re working out. I think I need to say that again. I know you want to lose the baby weight, but trust me, in due time it will come off as long as you’re eating right and exercising. Don’t forget that your body uses about 500 calories to breast feed, but it NEEDS calories to make that milk too! If you’re not eating enough calories your milk supply will suffer. This is a huge one. As a nurse, I can’t tell you how many times I’ve learned – “breastfeeding is all supply and demand”. 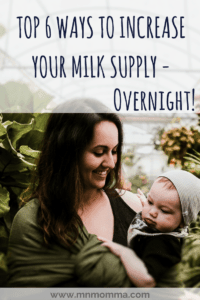 Even if you’re empty and your baby is nursing, that’s telling your body to make more milk! This is the most natural way to increase your milk supply. You don’t need to buy anything special, or eat a certain type of food or vitamin. Just keep breastfeeding! I know it can be tough, but you’ve got this! The body is amazing. If you’re looking for more information on breastfeeding supply & demand basics, check out this post. I wish everything that’s advertised worked as well as they claim, don’t you? That being said, I saw some pretty great results for the majority of tricks I tried. Oh, how I wish it would have worked for me. Many women swear by Fenugreek, but I was never able to give it the full trial run. O was so gassy and uncomfortable from it. The benefits: it’s a relatively easy method to increase your milk supply. You take 3 pills, 2-3 times a day, until your sweat starts to smell like maple syrup (no joke, that’s how you know it’s working and you’re at the right dose). My husband definitely noticed ;). This is absolutely a necessity. However – I already drink about 100 oz a day and adding more water only made me have to run to the bathroom more often. If you’re not a water drinker, consider one of these big bottles to help you set a goal each day (ie: 2 bottles a day). It’s so much easier to keep track of your intake this way. You can also add fruit for more flavor. These tips are what I found to work best for me. 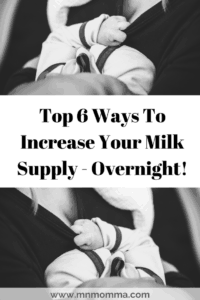 If you’re looking for ways to increase your milk supply, definitely give some of these a try if you haven’t! Subscribe below for your FREE milk inventory log. I wish I had this when I started pumping! The resource library also includes a pumping bag checklist, breastfeeding sign, and more! Completely FREE for you!